After the disappearance and apparent suicide of his adopted sister Lily, Leon has been searching for answers. Guided by a handwritten postcard, his quest for answers takes him to New York City and cold-hard truths that send him into a spiral of hatred and on the trail of a sadistic Russian crime lord. 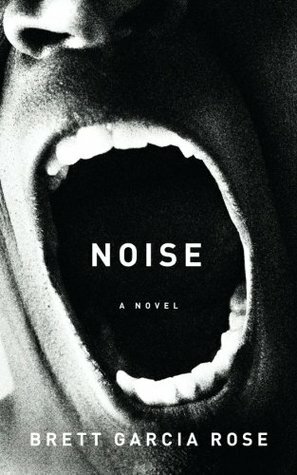 Noise is a dark and dirty look at the grimy criminal underbelly of New York city and one man's quest for justice and asks dark questions into how far we'd go for the ones we love. I'm not gonna lie this book was a pretty tough read. Not because it was particularly difficult, but the themes presented are particularly sensitive topics and the Garcia really delves into some horrible criminal situations too. Our protagonist (or antagonist depending on your stance), Leon, is such a compelling character. A total anti-hero, deeply affected by his upbringing in Nigeria, he was taught from a very early on to fend for himself. He's violent, angry and vengeful, but he's also passionate, with strong sense of justice despite his questionable ways of going about it. He also cares deeply about what happened to Lily to the point where he feels personally responsible - she is very much part of his heart and soul. This is less of a plot driven novel (the plot itself is one I've seen in crime novels and TV shows all the time) and much more of a character piece for Leon. Very few other characters actually make an impact on the reader as Leon is our eyes into this world. His world view is dark but, as I said, he's an anti-hero so we see the world just as cynically too. What is actually interesting is presence (or lack thereof) of Leon's disability. As the book's blurb hints, his deafness is hardly a hindrance in the story but does at times fuels his rage in a really interesting way. The end of the novel is a fittingly tragic conclusion to Leon's story and there's almost a sad, resignation as he accepts his fate. All in all, Noise is certainly worth reading, if anything, for Leon's journey as a character and the great character building Garcia has laid out in the book. For lovers of...Luther, Law & Order: SVU, and CSI: New York. *review copy c/o Book Publicity Services in exchange for an honest review.